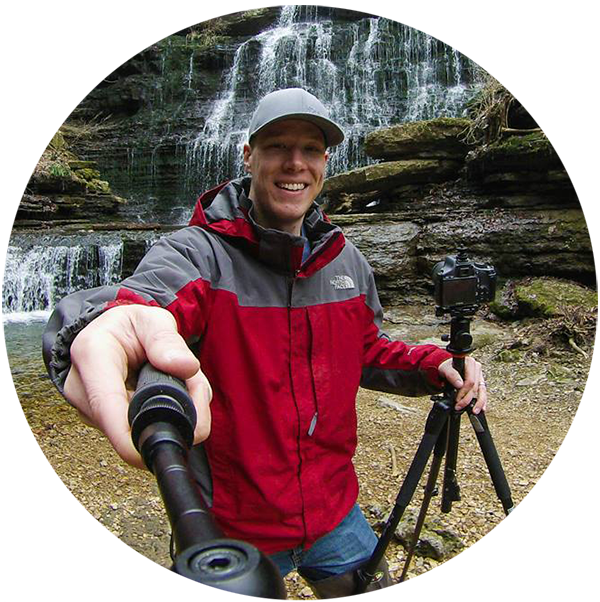 I believe that photographers should have a great idea of the shots that they want to take when they travel to a new location. I’m not talking about vague, general ideas about the shots you want to walk away with and add to your portfolio. I’m talking about very exact details of photographs that you think you can get. I had never been to Great Sand Dunes National Park, but I had really investigated some photos of the park that I knew I could put my own spin on with the early autumn conditions. I already knew about the interesting designs of the afternoon dune shadows and the classic overlook shot of the park, but I also knew that while I’d be there the rubber rabbitbrush shrubs would bloom with great yellow color and give me some amazing foreground colors. My excitement was at its peak. I arrived at the park and would only be there for a day and a half. However, I knew it would be plenty of time to get the four shots I wanted if conditions cooperated. Spoiler alert: the conditions cooperated! 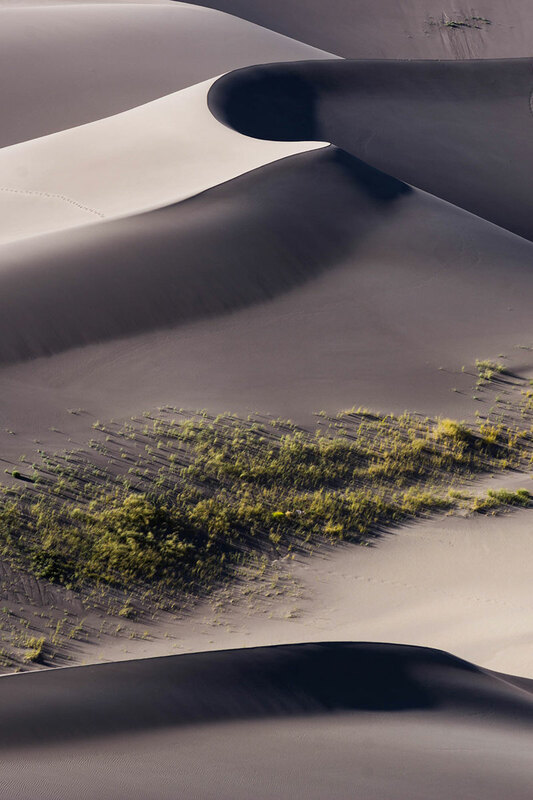 The first shot I wanted to get was a vertical photograph of a curved dune ridge in the afternoon using the shadows to provide contrast to the otherwise smooth sand. If you go to the park, you walk right out onto the dunes. Most everyone takes a direct route straight ahead which spoils any chance to eliminate footprints in your shot. However, if you go left about half a mile, you can shoot the dunes without footprints. A lot of photographers like shooting the dune ridges while the sun is setting. However, I wanted to be out on the dunes about two and a half hours before the sun went down so I could capture the shadows while they were relatively short and sharp. I also wanted to decrease the distance between dunes and get an abstract shot, so I used a 70-200 lens to achieve the effect I was going for. Next on the list was a shot of a single foot path. I know it’s cliche, but I still wanted to do it. Since I had walked to the left of the paths of other park patrons, I had to make my own path. I simply walked in a straight line. 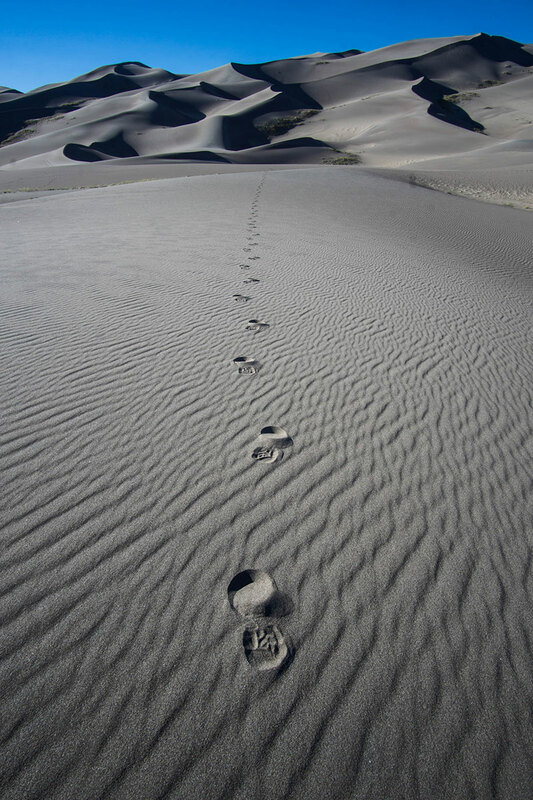 Next, I put my wide angle lens on and angled my lens to about 45 degrees to show my footprints in great detail as well as the dunes in the background. Yeah, it’s cliche, but it’s also pretty fun to do. Photo number three was the classic overlook shot of the dunes and mountains at sunset. During sunset, the dunes turn a beautiful magenta and look great against the mountains using a 70-200 lens. The best lookout for this shot is either the first or second pull off as you pass the park sign. The pull off areas after these two aren’t as good because they’re more angled to the mountains. I noticed that the rubber rabbitbrush was going to give me some amazing complimentary color to the magenta dunes and mountains. Lo and behold! I was right! As I stuffed my face with tacos I planned the sunrise shoot. 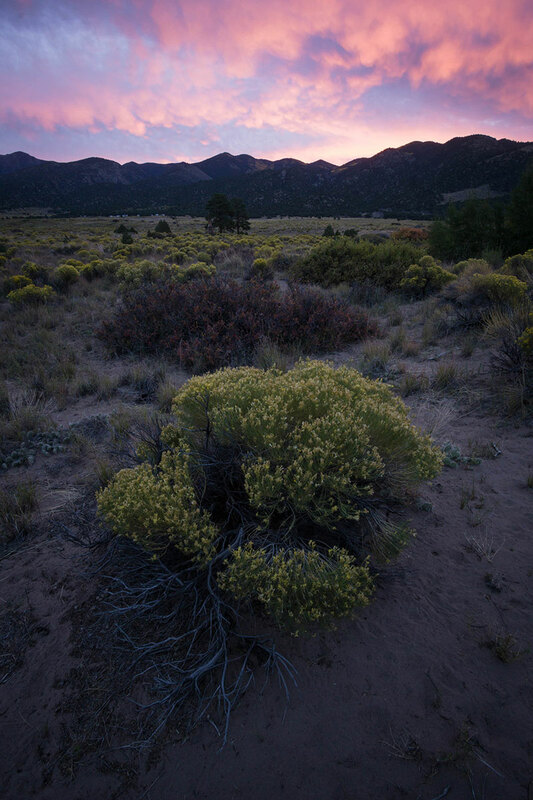 I would find a nice, round rubber rabbitbrush shrub as my foreground and shoot towards the sunrise and pray for color. It was a risky move because there weren’t any clouds in the forecast, but I was so sleep deprived that I decided to go for it. When I got to the location in the morning, there were some promising clouds right above my sunrise location. As the sun started to peak, the initial colors started to show. I knew this was going to be amazing. I made my last few composition adjustments; being sure I had everything perfectly set in place within the frame. When the colors in the sky went nuts, I was ready. It was the best photo of the trip. 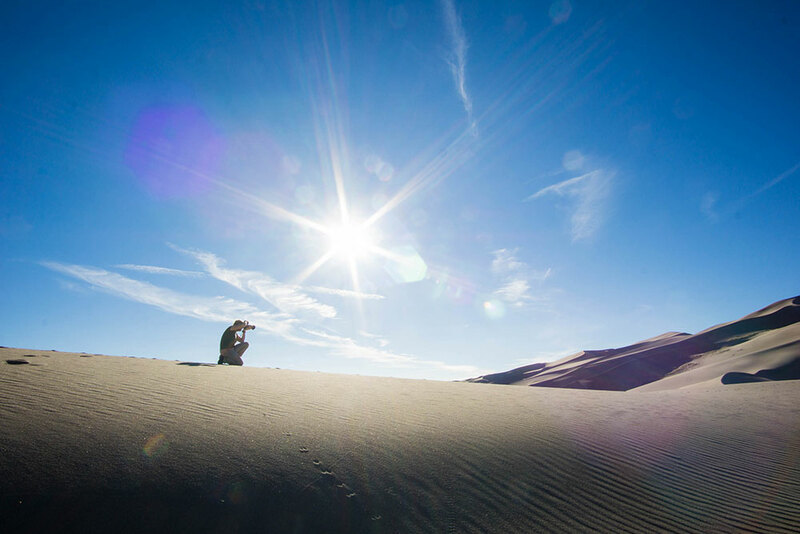 Even though Great Sand Dunes National Park is pretty small, it’s still packed with photo opportunities if you’re creative. It’s definitely worth a day or two of your time! Just watch out for wildlife as you drive into the park before sunrise. I learned that the hard way. Your shots of the dunes are absolutely BREATHTAKING!! Thank you for sharing them with us, together with your comments! I never thought of pre-planning possible shots. Whenever I visit a place it is likely somewhere I’ve not been before and often will not return to. I spend so much time trying to shoot on-the-fly I lose shots like you have shared. Thank you for prompting a new view for me. 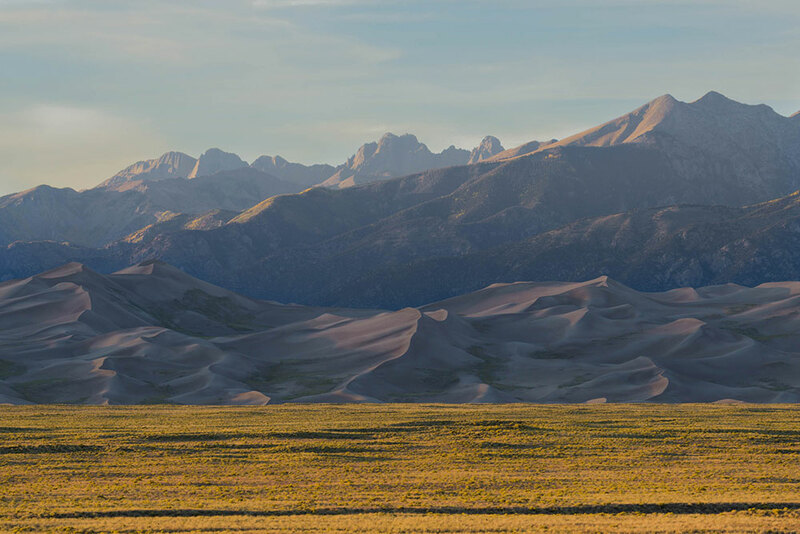 I live next door in Utah, but have never heard of Great Sand Dunes National Park before! Beautiful photos!!! I definitely will visit soon. What time of year did you take your pictures? What time of year is best overall for photography at the park?